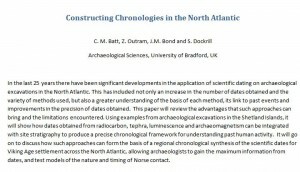 As discussed in the last post, one of the main activities this month has been contributing to the Nordic Theoretical Archaeology Group conference. This was followed by a rather more practical couple of weeks discussing Vikings with 7 year olds. Nordic TAG was an excellent conference; lots of stimulating papers and the chance to make very useful contacts, particularly with colleagues from Iceland, Faroe and Greenland. The session ‘A Stich in Time: Combining Analytical Chronology in a Scandinavian Context’ incorporated site based studies from excavations in Reykjavík and Shetland, in combination with more thematic papers on Viking Age Icelandic and North Atlantic chronologies, and an insight into tephra as a tool for understanding how people in the past responded to environmental change. The paper abstract from this project is available here. 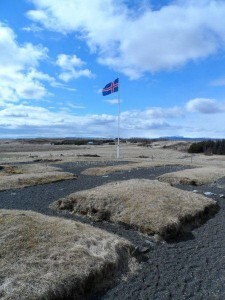 Inspiration also came in the form of site visits, which included the excavations at the Bishop’s Palace at Skálholt. It was reassuring to find that Iceland was considerably warmer than Yorkshire! In contrast to the deserted landscapes of Iceland, this month also saw a return to working on Vikings with Year 3 at Saltaire Primary School. This was an opportunity to try out some ideas for active learning about the Vikings with a lively and engaged audience of 60 children. 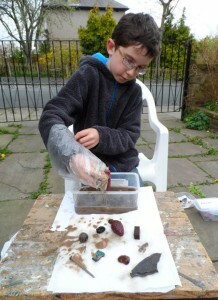 We excavated the (rather smelly) results of ‘Rot or Not’ discussed previously, had a go at Viking weaving and cord making, became dustbin detectives, made chocolate Thor’s hammers and learnt about Viking diets by excavating poo. The activities went down very well and feedback from pupils and teachers has helped develop them into lesson plans that will be freely available from the project website. 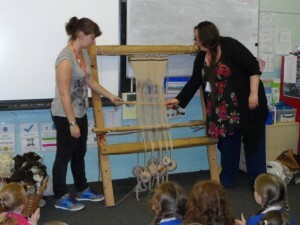 Dr Chrissie Freeth and Kayla McCroakam demonstrate Viking weaving. Rot or not concludes in a well-ventilated space! Immediate plans are now for something not quite as stimulating but a little less tiring- more data gathering, this time moving onto the Northern Isles.